When other people are probably doing something like reading in bed, this is what I've been doing. It isn't exactly a nightly thing but it's getting close to it. I thought about making this a 365-day challenge but I don't want to put that limitation on it. It's just for fun (and therapy on the weary days) and it's great practice. - Faber-Castell Pitt artist pen - the tip is flexible similar to a brush and it glides so smoothly on the paper. I think it's too thick for smaller illustrations but it's perfect for this format I'm using. This pen came in a set that has other thinner pens but this is the only one I've used so far. - Strathmore Sketch 11 x 14 spiral bound pad - I love that the ink doesn't bleed onto the next page. Not even on the back of the page I've drawn on. It takes the ink really well. I've been posting some of these on Instagram, where you can tell they are taken in my poorly lit room. I'm keeping it real there—on my bed and all. but I'm enjoying the newness of it all. That's so funny...coz while *I* am in bed I sleep! LOL! Just kidding. These are beautiful as always. With the close up of the 1st picture, it almost appears they are 3D! I found in Michael's a coloring book for adults as I call it. It's from Creative Haven (part of Dover Pub) and this is called "Floral Designs" The artwork is by Jessica Mazurkiewicz. http://www.doverpublications.com/creativehaven is their website. I've been playing in that with coloring from a variety of toys, er...tools. The Glaze Pens from Sakura are my favorite so far. 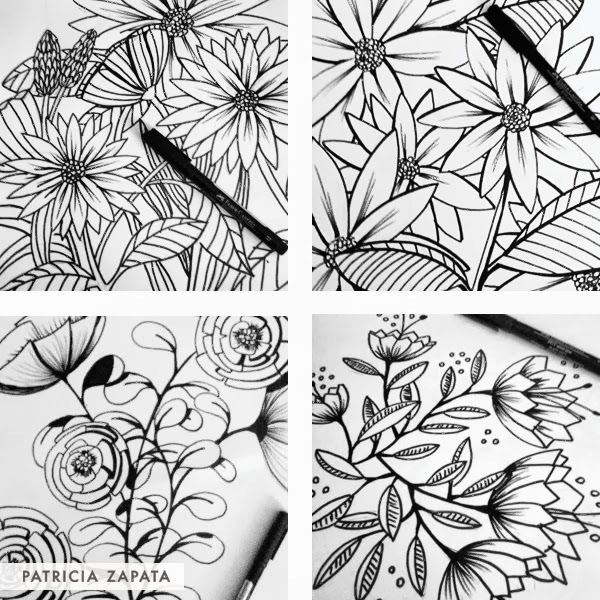 I can SEE YOUR artwork in one of these types of books for people to buy and color as a way to relax. Can't wait to see your idea come to life!